How do you get to the light at the end of the tunnel? When you fall, what direction do you head to? When you reach the bottom of the hill, don’t you hike back up? When you cried your eyes out, don’t you start feeling better? When you made a mistake, don’t you ponder and move on? There’s nothing you can do to undo what’s already been done. The difference is your attitude in moving forward! But once it’s done – kick yourself and stand up and make the most of it! When you are hurting, force yourself to smile. It takes too much energy to be negative and miserable. But learning from what transpired - and picking up the pieces. They fall and whimper, they complain and whine. Yet they pull themselves together, standing up, bright-eyed and giggling. As true as the sun sets and as glorious as the sun rises the next day. You and only you can direct the movie of your life! Have faith in God, your family and yourself. How do you face the detours of life? Once I get to the light at the end of the tunnel, it's always nice to have that apple-pie with vanilla ice cream, halo-halo or mojito depending on how tough the walk is! 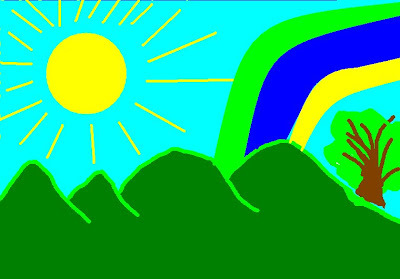 Artwork by my 8yo using PAINT. Thanks again for these reminders. Sometimes I catch myself looking back and wallow in that "was" or "what could have been." I'm glad I found your blog; you've been an inspiration to me. @Becca, I think we all inspire each other, glad you're here, too! @Alicia - so true, Amen! In order to get to the light at the end of the tunnel, you just have to keep on walking. I sometimes want to just sit on bottom and not move but then, I would stay stuck and not go anywhere! Thanks for sharing. It was worth reading again and again. That was beautiful, Jenjen. Truly a great reminder for a pessimist like me. @ChocolateCoveredDreams - I do have to remind myself over and over at times...Just need to keep moving! @Veronica - I never would have thought you're a pessimist! @Melinda - welcome back! Glad to see you here..Complain and then move-on, yes! So beautifuly written. Dwelling really never helps does it. I have to say I just keep walking, sooner or later I'll hit the end..and I know it will be all worth it! Boy is it ever, It's kinda like my teenager. I never gave up hope.. and now.. well he's kind of seen the light.. LOVED YOUR POST JEN JEN!! @ModernMom - Glad to see you here! You're right - sometimes we're pulled to dwell - just temporarily feels good but then - bang! It just makes your heart feel heavy! @Buckeroomama - love that you're here! I believe our paths have crossed to inspire each other! @Tami, same here with my kids. We should never give up on them no matter how trivial it is! Just keep walking - remember the footprints in the sand? Your posts are always so uplifting and inspiring! I've always believed that when you hit rock bottom, the only way to go is up...that belief is what's gotten me through a lot of trials. Still in Manila - Do you take things for granted?